Though it's come a long way since launch in 2014, Microsoft is still hard at work cleaning up the Xbox One's trademark messy Home screen. In its latest attempt to clear up the clutter, Microsoft is introducing an update that, among other things, brings a customizable Home designed to get you right to your favorite games, apps and friends. 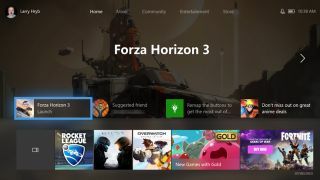 Rolling out now to members of Xbox's Insider program, starting at the Alpha Ring tier, the updated home screen allows you jump back into your most recent game from the very first menu, plus shortcuts for your favorite games and friends — chosen and organized at your discretion. In addition to the Home menu, the Community screen — where users share their game clips, achievements and other goings-on with each other — is also getting a revamp for easier browsing. The Guide tab, used for quick navigation on the side, has also been tweaked for faster use — making getting to certain shortcuts like the settings menu that much quicker. It's not just Xbox owners who will benefit from this update, either. Windows 10 users will also get a redesigned Game Bar feature that allows console and PC players to quickly access streaming and broadcast options mid-game. While we're glad Xbox is (constantly) re-tooling its interface for ease-of-use, the reliance on cluttered icons and excessive ads remain the primary bane of the console's menus, which should probably get fixed before the Xbox One X shows up later this year.